WITH THE WENTWORTH BY-ELECTION AND VICTORIAN STATE ELECTION LOOMING, ONE TEACHER IS CALLING TO END EXAMPLES OF ‘UGLY BULLYING’ IN POLITICS BY CHANGING THE WAY WE DEBATE. Margaret Hepworth, creator of Collaborative Debating, is teaching non-adversarial debating in schools across Melbourne. She says it is time our politicians learnt it too. Hepworth is available for interviews, and you can hear from the secondary students themselves, sharing their Collaborative Debating experience, and discussing their desire to see change with current political debate. “Our young people learn respectful ways to listen and engage with opposing viewpoints. To evolve to be a more inclusive and informed society, we need to change some of the structures by which we learn. Our politicians plan how to tear their opposition down. Why aren’t they planning together how to solve the country’s problems?” Hepworth poignantly asks. I will be speaking at the Unleash the Beast Writing and Wellbeing Symposium on Wed Oct 10th. I am excited and somewhat nervous - I admit! What will be special about this particular session on 'Bullying - Can we actually do anything to stop it?' is that as well as hearing from Tick Everett, father of Dolly Everett and co-founder of Dolly’s Dream Foundation, this will not just be a conversation. I will be demonstrating some of the techniques and tools that I use when working on these very same issues with young people in schools. This should be very useful in progressing all our learning around this very serious issue - bullying - that not only continues in our schools, yet also too often in our workplaces, our homes and even our politics. If you can be there, hope to see you there! In a world often faced by overwhelm and despair for our young people, there is hope and optimism on the rise. Good Education Group is excited to announce our partnership with The Gandhi Experiment. This initiative, founded by author and educator Margaret Hepworth, is based on the concept of world peace through education. The Gandhi Experiment teaches global citizenship through Gandhian principles of non-violence, relationship building and forgiveness, to resolve conflict and build a more positive future. Margaret has lived and taught in Australia, China and the USA, building her expertise in teenage motivation and behaviour. The recipient of the 2016 Sir John Monash Award for Inspirational Women’s Leadership, Margaret has more than 30 years of experience in the education sector, including a period as Head of Campus at Preshil School. She has published three books: Clarity in Time (2012), Collaborative Debating (2016) and The Gandhi Experiment – Teaching Our Teenagers How to Become Global Citizens (2017). Her program ‘Global Citizenship – It Starts with Us!’ has been taken into schools across Melbourne, India, Pakistan and Indonesia. Good Education Group CEO Chris Lester believes this collaboration will be a fruitful endeavour and highlights the importance of an education beyond the text books. Margaret is also excited about the opportunities that lie ahead. A positively new framework for Debating, where the ‘win’ is the solution to the problem. The Collaborative Debating Manual is the latest educational tool for social change developed by Australian educator and author, Margaret Hepworth, founder of The Gandhi Experiment. Imagine a debate where an Affirmative team is being met with a Cooperative team; a Mindful Coordinator chairs the debate; and a Mentor who doesn’t judge, score or rate, instead meters out a series of Guidances. Now you have a Collaborative Debate – a debate that may actually get us somewhere beyond the arguments, towards the solutions that we are seeking. These are debates where young people develop skills for real life that move beyond simply learning for the sake of learning. They will take these skills into their homes, their communities and lives. Margaret's amazing debating techniques and skilled, insightful facilitation helped us all understand how we can turn a combative, competitive state to one of deep compassion and collaboration. She changed our view of how debating can be done for ever. Highly recommended and essential learning for schools and companies everywhere. Collaborative Debating is a useful tool for our community to learn how to tackle the big issues in a way that promotes solutions over winning. This could help our leaders of tomorrow to become more active citizens and thoughtful decision makers. Collaborative Debating eliminates the adversarial nature of debate. It is designed to teach our young people critical thinking, reflection and cooperation. It is cutting-edge education that builds the framework for change. Bringing the creative genius of Margaret Hepworth into schools across Australia. Recipient of the 2016 Sir John Monash Award for Inspirational Women’s Leadership, Margaret Hepworth is the founder of The Gandhi Experiment, a social enterprise, whose vision is ‘World peace through education.’ Her drive and commitment for social justice has grown and flourished through her secondary teaching of 30 years. Margaret is the author of the forthcoming book: The Gandhi Experiment – Teaching our teenagers how to become global citizens. (Rupa, January 2017). Margaret is a former Head of Campus (Vice-Principal) at Preshil School in Melbourne, Australia, and an international educator. Margaret Hepworth can be contacted at margaret@margarethepworth.comor on +61422154875 or www.thegandhiexperiment.com. The life and times of the iconic former President of South Africa, the late Nelson Mandela, will be the focus of this month’s Guest Writer Session holding on Saturday at Nanet Suites, Central Business District, Abuja. The session, being organised by Abuja Writers Forum, will feature poems, short stories, music, and talk on contemporary South African literature to commemorate the late Mandela. It is an extension of the Nelson Mandela Day celebration. MargaretHepworth is an Australian author, educator and facilitator. She had to receive permission from the Nelson Mandela Foundation in South Africa to use Mandela as a fictional character in her novel, Clarity In Time. While he is a pivotal character, the novel tells the story of a young Australian teacher who comes to understand that it is no longer enough to be a by-stander; that we all need to take mindful action. Nelson Mandela, according to Hepworth, has been a role model to all. As an educator, she refers to stories of Mandela in her peace building workshops to teach young people about the choices that our world leaders can make – for reconciliation and forgiveness. She paraphrases Mandela to encourage young people to rise above their own expectations of themselves. "The annual Sir John Monash Awards have been handed out... ... Margaret Hepworth won the Inspirational Women's Leadership award..."
With three friends, he launched the Afghan Australian Initiative (AAI), a community-based effort that seeks to create common ground among the many communities in Victoria. Within weeks, they were meeting with their local MPs and council, and sketching out plans. Afghans in Australia are largely from three main ethnicities – Hazara, Tajik and Pashtun. The AAI’s community work sought to engage with as many people from these groups as possible. Nazer and his friends hoped that their approach would help to counter the risks of isolation and negativity – difficulties that in some countries have created a fertile breeding ground for the radicalization of Islamic youth. While the AAI was taking shape, Margaret Hepworth, a secondary school teacher of 30 years, was beginning to organize student conferences in peace building skills in Melbourne. She met Nazer at an IofC monthly meeting, and he invited her to speak at the launch of the AAI. “After that, we came up with the thought, let’s do some work together,” she said. Together, they decided to run a conference with a specific focus on Afghan youth. Initially, AAI and The Gandhi Experiment had planned for the conference to focus on bringing together Afghan youth to mix with others from high schools in the Dandenong area. “In taking these conferences to schools, sometimes it’s about the one teacher who says ‘yes’,” said Margaret. This time around, that teacher came from Scotch College, Hawthorn, whose students were studying conflict zones as part of their humanities curriculum. Afghanistan was one of those zones. “From this point, it all came together,” Margaret recalled. 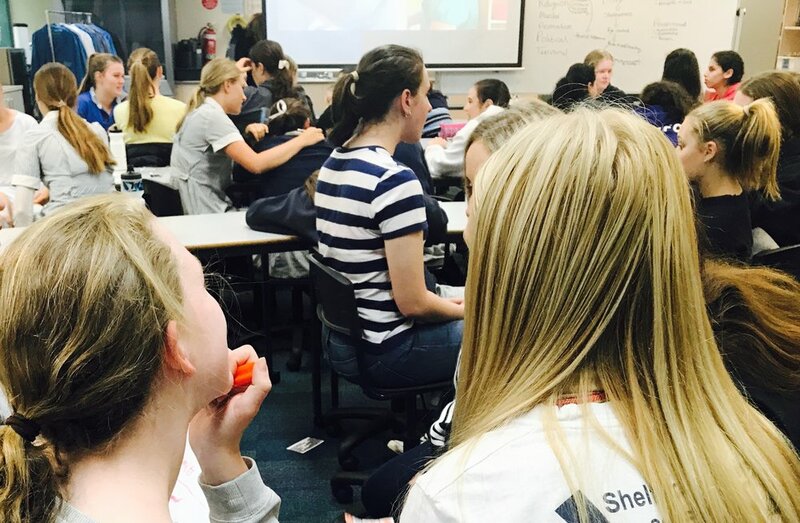 The Southern Migrant and Refugee Centre in Dandenong provided a room for free, and more than 60 students attended, from diverse educational institutions. They included young people from Scotch College – whose alumni have received more Order of Australia honours than any other school – alongside those from schools including Doveton College, Narre Warren P-12 and Minaret College, a high school for Muslim students incorporating Islamic studies with the Australian education system. Reflecting on the conference, Nazer said, “Radicalization can be caused by many factors. When people lose hope, when they feel useless, when they have lost a part of their lives, they can turn against society, even against their own father and mother.” To counter this, the conference placed a strong emphasis on teaching positivity and belonging. Additionally - putting thoughts into action – three men in their 20s, who had completed the IofC Life Matters workshop with Nazer, came along to provide additional support at the conference. Besides the student conference, the AAI has organized workshops for others in the community, with 20 to 25 participants attending each time: one for Afghan women on how to respond to negative behavior from others, another for civil society activists, and a third, conducted in the Dari language, for elders in the Afghan community. The workshops addressed communication and cultural issues, and provide opportunities for meaningful conversations. “It’s pleasant and wonderful to live in a multicultural society,” said Nazer. “Given that the Afghan community is very new, we need to do some work to bring people together – to talk to each other and go out of our comfort zones, rather than staying in our own small circles.” In his day job at the City of Casey as a community worker with the Afghan community, he noted there are still some language barriers. “Some people are not able to communicate in the market, or while out shopping,” he said. “But when they’re together in the room with someone, they feel more relaxed, there’s someone there they want to talk to, they’re trying to learn something from each other.” By creating the opportunities for people to get together in the same room, he hopes the AAI will help bridge the “culture gap” and promote social cohesion. The Gandhi Experiment is a social enterprise, and relies on gifts and conference registrations to cover costs and generate a modest income for facilitators. The AAI is a community organization depends on grants and volunteers; see more about the organization on the AAI Facebook page. At 3.15 am, 28 March, Margaret Hepworth’s phone beeped with a message from Lahore, saying a school she had visited just a month before was ‘marked safe’ following the suicide bomber blast which killed 72 people. Inspired by her visits to India and teamwork with Indian educators (see Newsbriefs Feb 2015) Victorian educator Margaret launched The Gandhi Experiment last year to introduce non-violent peace-building into schools, here and overseas. Invited to present at Lahore’s Allama Iqbal Open University in February, she held four workshops in schools on the same visit. One day after returning to Melbourne she was in Dandenong, planning with Nazer Nazir, an Afghan graduate of Life Matters who started the Afghan Australian Initiative (AAI), for a school conference which, on 9 March, brought together 80 people – Afghan refugee youth and local students – to workshop on ‘Global participation – it starts with us’. In between, on 27 February, Margaret and IofC volunteers also supported the AAI at their workshop for Afghan women on ‘Positive responses to negativity’, funded by Dandenong City Council. It was also attended also by Yvette Shaw, senior community engagement officer working on a social cohesion under the department of Premier and Cabinet, and by local MP Gabrielle Williams. Check out this article in The Weekly Review about tomorrow's event! There is also a thumbnail on their website - see below. This month's BeneConnect forum welcomes Margaret Hepworth, an internationally acclaimed educational facilitator whose work involves moving teenagers from apathy to action. Margaret will lead us on a journey into her work and how we can equip our upcoming generation of decision-makers, problem solvers, community builders and global citizens with the tools and strategies to create peace. This presentation will be followed by an open discussion and Q&A session. We then invite you to stay and enjoy a delicious afternoon tea with like-minded company in the lovely surrounds of Benevolence House. 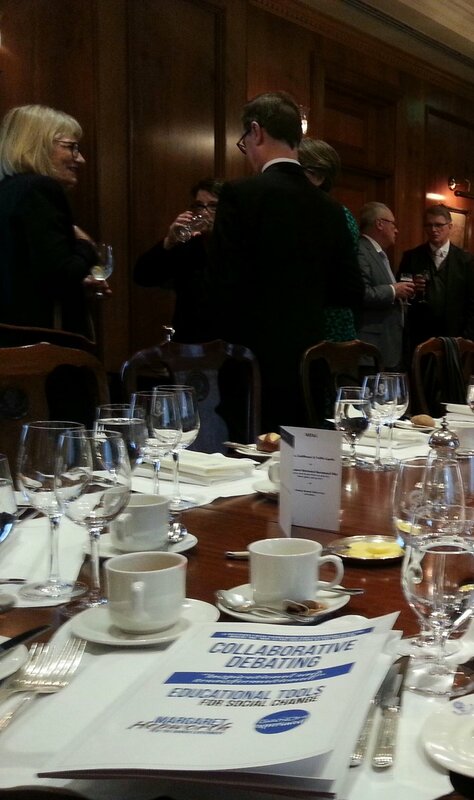 Marg Hepworth is hosting a 'Slow Dinner' to introduce Collaborative Debating into the world of business. Held at The Slow School of Business — a business school which prioritises a conscious and mindful approach to corporate culture, the evening hopes to be an eye opening experience. Collaborative debating transforms negotiations from the frame of "winning" into the frame of finding solutions to problems, a communication approach that has very real applications in the business world. The dinner will take place at 6pm on Tuesday 4th of August. This event is fully catered, with food and beverage included in the ticket price. The IofC India team of educators, working through Education Today, Society Tomorrow, believes that change will come through education. When taking this message across India last October-November through peacebuilding workshops in schools, something extraordinary happened: I found myself connected with a team of Indian educators and others working towards building peace bridges between India and Pakistan. My own vision began to form: of Pakistani and Indian children coming together at the Wagah border to which I was taken while running workshops in Amritsar. Unexpectedly, I met Chintan Girish Modi, in Mumbai. Chintan is a joy-filled, tenacious character, whose community initiative, Friendships Across Borders, is a testimony to his life-long dream of bridging the divide between India and Pakistan. Through it, Chintan and his team create email-pals between the separated peoples of these tense and wounded nations. When the massacre of school children took place in Peshawar, their immediate call for letters of love and support to the people of Pakistan from India generated a flood. What grew from my visions has taken flight with an initiative called ‘When the Sword becomes Words’. We are creating a music video that incorporates school children from Pakistan, India, Australia, Fiji and China united in singing the inspiring song One Day. Yesterday I received my first email from a Pakistani teacher confirming that the dream has begun. Our intention is that Indian and Pakistani children will “come from their hearts”, to use Chintan’s words, so that when they finally meet, hatred and ignorance will unravel. Peace educator Margaret Hepworth paid a very special visit to The Universal School. Her workshops - The Gandhi Experiment and Make Noise for Peace were well received by the students and teachers alike. An ardent believer of social justice, Margaret left her mark on the minds of all at Universal who pledge to incorporate her ideas and work with rejuvenated rigour on the theme of Global Citizenship. Photos can be viewed at The Universal School's website. Click the title of the post to go straight to the article. Melbourne-based peace educator Margaret Hepworth is harping on this message in Jamshedpur schools. Margaret Hepworth: Author, Educator, Facilitator, and Champion For Peace is off to India! On her latest journey to the homeland of Mohandas Karamchand Gandhi *and* one of the most important sites of growth in the coming century — Marg will be conducting peace-building in schools as part of 'The Gandhi Experiment: Developing Global Citizens'. 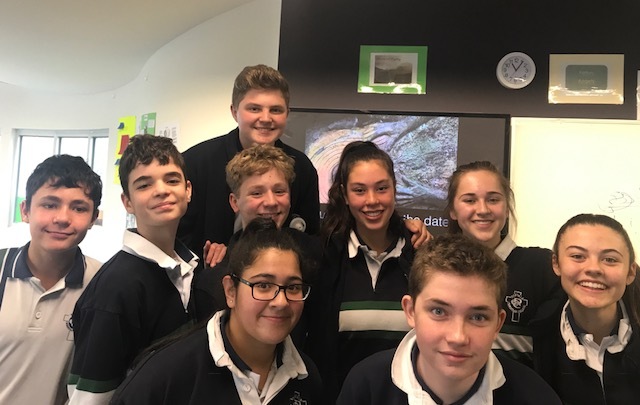 MELBOURNE, Australia – Author and educator Margaret Hepworth has created a student workshop: conversations that move students to action and commitment. Secondary school students are invited to a ‘Dinner Party’ in their own classroom where, along with the scrumptious food, the main item on the menu will be their thinking processes. Nelson Mandela Foundation grants Australian author permission to use Nelson Mandela as fictional character. MELBOURNE, Australia – Author and educator Margaret Hepworth has been granted permission to use Nelson Mandela as a key fictional character in her novel Clarity in Time (published by Balboa Press). Her novel is now housed in the Nelson Mandela Foundation's Resource Centre. The book opens with Nelson Mandela, as a fictional character, talking to his White jailer, Dirk Kortella, in a lonely prison cell in South Africa. Their conversations on life, humankind, God and liberty were confidential since, in an Apartheid state, the consequences of sharing thoughts and philosophy or anything with a Black man would be, for the loyalist, unfathomable. Thou shalt love. The phrase wafted across the mountain top, swirled gently, once, and settled itself deeply in her conscious and unconscious mind. ‘I think I know what that means,’ Rosie whispered to herself. But she was only halfway there. The rest of the world wasn’t even close. It seems the Ten Commandments have hit the headlines again. Whilst Alain de Botton, founder of the School of Life and modern day philosopher, announced his ‘Ten Commandments for virtuous atheists’, deemed ten worthy concepts relevant to our contemporary world, Margaret Hepworth, author of the powerful and evocative novel, Clarity in Time: A Philosophical and Psychological Journey, has reduced the ten to one: Thou Shalt Love. Nelson Mandela sits in full-fledged discussion in a barren prison cell - Robben Island 1972. His counterpart, the still youthful Dirk Kortella, his Afrikaner jailer, a product of his system. Mandela speaks of meaning through language, love, humanity and Almost Impossible Thoughts. Kortella listens. Yet this fictional novel, Clarity in Time, isn’t Mandela’s story. Rather it is the story of the ‘interested bystander’ - those among us who read the newspapers over breakfast, stamp our feet at the evening news in the comfort of our lounge-rooms, share these same concerned discussions with our friends and loved ones over our dining room tables, yet don’t know how to move our thoughts into action – beyond the confines of our own four walls.